This book analyses how national parliaments and parliamentary parties performed their legislative, representative and control functions during the reform of European economic governance. Focusing on domestic approvals of anti-crisis measures (EFSF, ESM and the Fiscal Compact) in all member states of the Eurozone, the book aims at establishing to what extent national parliaments and parliamentary parties secured their competences in EU policy-making during that process. Taking an interdisciplinary approach, In order to address that question the book employs an interdisciplinary approach and analyses (i) in which states parliaments’ formal powers in approval of anti-crisis measures were constrained, (ii) how parliamentary parties voted on the analysed measures, (iii) what were the dominant discourses of their proponents and opponents and (iv) which parties advocated neoliberal and which Keynesian measures. This text will be of key interest to scholars, students and practitioners in European Union politics and studies, political parties and parliaments, European Economic governance and more broadly to European politics. 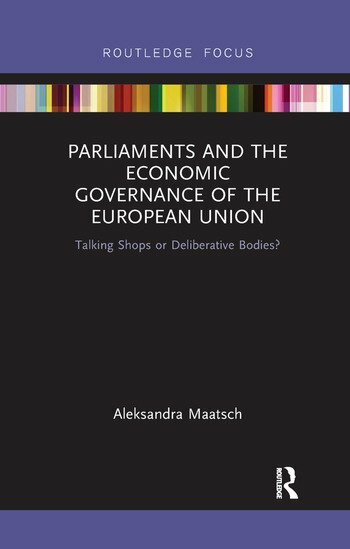 i.. National Parliaments in the Reform of European Economic Governance: Talking Shops or Deliberative Bodies? ii. National Parliaments in the European Union: From De-Parliamentarisation to Re-Parliamentarisation. iv. How Do Parliaments Contribute to Closing the Legitimacy Gap? 4. Drivers of Political Parties’ Voting Behaviour in European Economic Governance: The Ultimate Decline of the Economic Cleavage? iii. Which Factors Account for Political Parties’ Positioning on Macroeconomic Policies? Hypotheses of This Study. Aleksandra Maatsch is Chair of European and Multilevel Politics (Interim), University of Cologne, Germany.